My thanks to my good friend Gautam for loaning me his pen case for review. Franklin Christoph is a company known for their acrylic fountain pens, especially those in ice finish. I have previously reviewed one such pen, the Franklin Christoph Model 66 Stabilis. It is a beautiful demonstrator desk fountain pen. 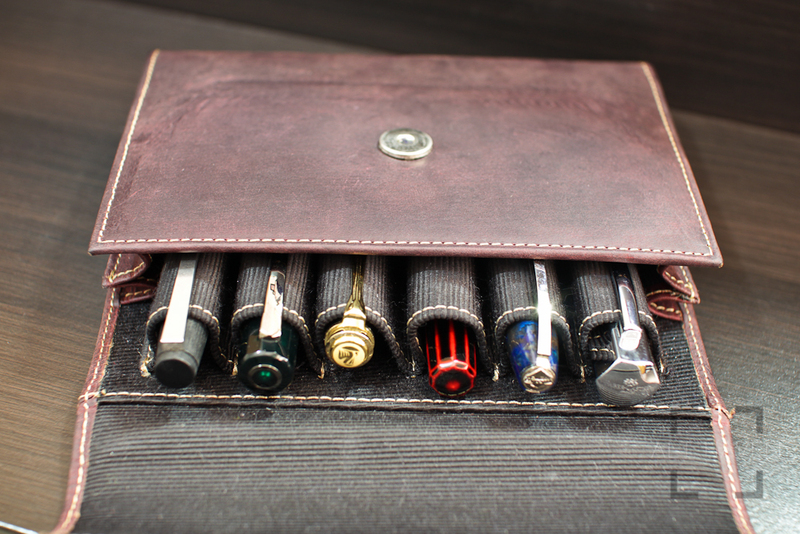 However, Franklin Christoph is also a maker of leather pen cases. They make a wide variety of pen cases which ranged from the single pen sleeve to the mammoth 80 pen briefcase. Today I am reviewing the Penvelope 6, Franklin Christoph’s leather 6 pen case. 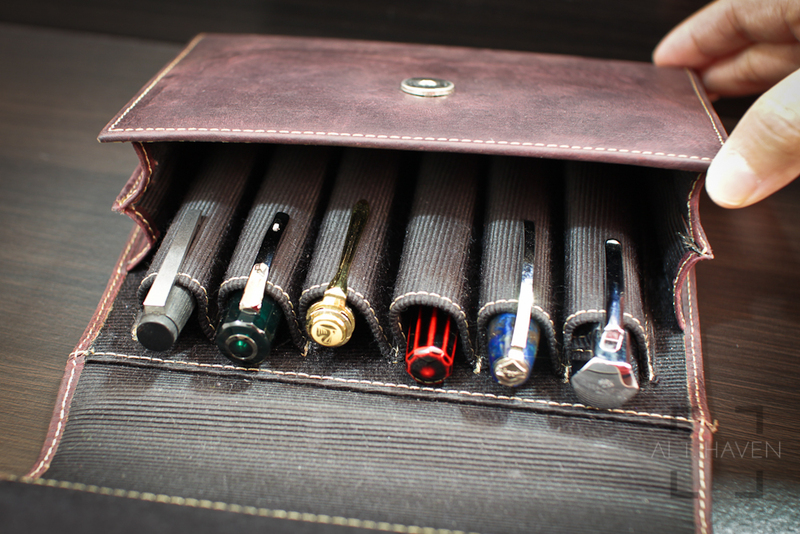 The Penvelope style pen cases comes in 6 and 13 pen varieties only. They have the option of the brown, black and dark maroon leather. I am reviewing the brown Penvelope 6. 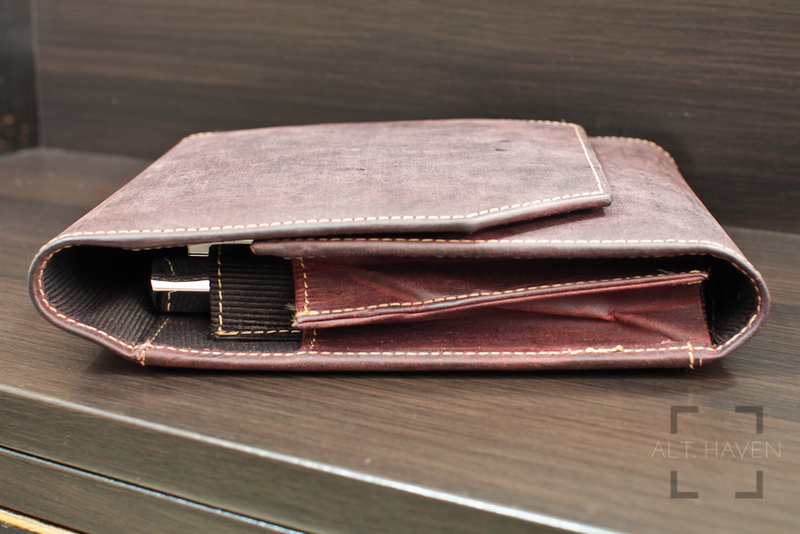 The dark brown leather is accented with a tan colour stitching. The leather used feels smooth and premium to the touch. As with all leather goods, leather would change its colour as it gets exposed to hand oil and would pick up nicks and scratches depending on how the owner treats it. The stitching is done neatly and there is no loose threads. I love that the edges of the case is burnished nicely. The Penvelope 6 feels nicely finished with the Franklin Christoph logo embossed on the back of the case. As the name suggests, the Penvelope 6 is styled like an envelope. The top half folds over the pen slots. The flap is stiff and hard and it is secured with a magnetic button. At first I was constantly hunting around for the matching end to secure the flap. After a week of hunting around I discovered the trick. The button tend to close lower than where its matching pair is situated so I had to move upwards to close it. I don’t know if this is the case (pardon the pun) for all Penvelope 6 cases, or this is the odd case out. Personally I would highly prefer if the closure is situated such that it would be at the nature closing point of the flap. Considering that the flap is not a floppy sort of leather, this can be easily achieved if the button was moved just slightly lower. 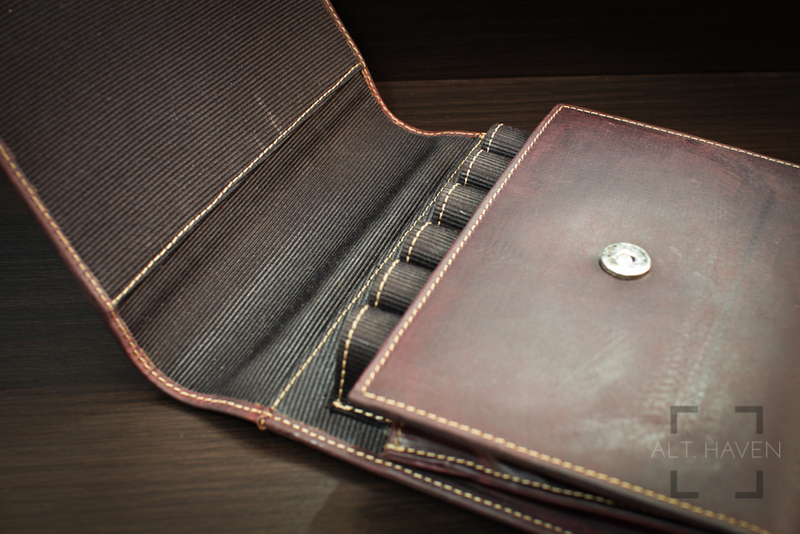 Inside the Penvelope 6, you will find the case lined with a ribbed fabric. The pen slots are made of the same fabric. The slots are stiff and it holds its shape very well. However the edges of the fabric feels a little rough. I’d be afraid that it might end up scratching the exterior of the wider pens. My Delta Dolcevita Stantuffo and OMAS Arte Italiana are the widest pens I have. Both managed to fit into the slots with some coaxing. Personally I don’t mind my pens having micro scratches on them but the “roughness” of the edges is subjective so it is more a matter of your personal threshold for it. On a positive note, I do like that the pen slots are stiff. I can slide the clip over the slots easily with just one hand. For softer cases such as Nock Co’s Lookout, I have to hold on to the fabric while the other hand pushes the pen down. There is no such need for the Franklin Christoph Penvelope 6. However on the other hand, the Penvelope 6 doesn’t work for short and/or narrow pens without a clip. The pens would just slide to the bottom of the Pevelope 6 and retrieving your pen would be more akin to a fishing expedition. There is no getting your pen back short of turn the case upside down. However, the pen slots extend almost all the way down the case to truly separate your pens from each other. That way, the pens wouldn’t accidentally knock into each other. Though your pens are protected from the top and bottom, it is not from the sides. The sides are open and exposed because the stiff leather wouldn’t wrap itself around the pens. However your pens are about 2.5cm away from the edge of the case. The stiff and hardy leather has its own advantage too. I feel my pens are safe even if the case were to fall from table height. Overall, the Franklin Christoph Penvelope 6 is a premium product with a similar price tag to match. The quirks of the case are not entirely deal breakers for me but they might be for others. I am sure this is a product that can be improved upon especially with the magnetic closure position and the edges of pen slots. Once those are rectified, I might consider a Penvelope 6 for myself but before that I’d stick to what I currently have.